The Last Express allows you to move freely through the rich and detailed 3-D environment of the world's most luxurious train, circa 1914, during its final European crossing prior to the outbreak of WWI. Game play involves interacting with characters, exploring objects, engaging in action sequences, and uncovering multiple story threads--with your perspective shifting from first person to third person for maximum dramatic effect. Information gained is used to piece together a series of interrelated puzzles, which advance you through the story. If you are clever enough, you ultimately discover the shocking secrets of The Last Express ... before it's too late! Jordan Mechner's riveting The Last Express was unusual for a number of reasons: the game allowed the player to explore the legendary Orient Express, with details recovered from vintage Orient cars and photos, and there were several countries involved in political intrigue on board (Russian, Serbs, Persians, Germans, etc.). Most striking are the game's visuals; artists used real-time video capture, then translated the images to 2D pen-and-ink outlines (much like those black-and-white books of Art Nouveau clipart). This is not always successful; characters are more like expressive, oversimplified cartoons, and motions are jerky, but combined with top-notch voicework, this is easily overlooked. Also, the characters' dialogue is recorded in the various languages of each nationality: as American Robert Cath, you will eavesdrop on conversations in various languages (which will appear translated in subtitles, but only for languages that Robert speaks!). Your fellow passengers may not be what they seem; there are hidden deals and dark secrets afoot. The inventory-based puzzles are generally straightforward and intuitive, and the game's small environment eliminates tedious backtracking. The several arcade-style action sequences are not as successful and suffer from slow, jerky controls, meaning that if you die you'll have to play again and again before you can move on. Overall, the combination of detailed backstory, attention to period detail, the many languages and nationalities, the cinematic score, and rich visuals make this a game to treasure. This game is simply beautiful. I lost my copy a few years ago, so I can't go into as much detail as some of the other reviewers, but I feel it my duty to say that any adventure gamer who didn't take a chance on this game missed out on something great. The real-time element is executed very well--in my opinion, better than any other adventure game I've ever played in which real-time was attempted on that scale (i.e. throughout the whole game). The story is engaging all the way through, and the unfolding international intrigues ought to keep many nerds hooked, not a little because, even in the relatively-isolated environment of a train, you are witness to the birth of a world war. The period environment is subtly and expertly put together: you will overhear workers on the express debating about socialism, and travel companions (some of whom are very "close") talking about the evolving mores of the time, and more! Who knew that spying on other people's lives could be so enriching? In my opinion, the other passengers are generally interesting enough (especially since most of them are more than what they seem) that just walking around on the train--which you'll be doing a lot, especially earlier in the game--is a pleasurable experience. Throw in spies, arms dealers, time bombs, fist-fights, and Serbian terrorists, and the comparison with Indiana Jones is more than fair. Justus Pendleton is right that there are a few flaws in the game, and these do cause potential anachronisms. I also was frustrated by how the game designers handled that puzzle where you steal the rich African guy's "rather heavy briefcase", because to me it also seemed that the only logical way to handle things would have been to sneak back out through the skylight. But when I finally decided to try just walking through the door into the concert, I actually found the solution rather pleasing. First of all, it does make a little sense: you know the rich guy's goon is going to realize the briefcase is gone, find you alone on the way to your room, and then take you out. If nobody saw you anywhere on board the rich guy's personal car they'll have no reason to believe your disappearance had anything to do with him. If, on the other hand, you quite ostensibly walk through the room and get everybody's attention, the rich guy no longer can easily deny connection with your mysterious death--nor can he call "thief" on you without causing a scene and calling attention to the contents of the briefcase. As in the case with dumping Tyler Whitney's body and impersonating him, sometimes the player is in such a tight bind (with so little time to act) that an unorthodox, even disrespectful solution might be the only one available--I think the game is actually a little adult in this respect. Plus, it was hilarious to see the look on Mr. Rich Guy's face as you just casually stroll through. The Greatest Game Of All Time! The best computer game ever? I've owned this game for two years, and still play it on my iMac. It is timeless and THAT good, with excellent characterizations, well-thought out plots and timelines. The game is so unusual, as it has separate timelines going on at the same time; i.e. depending where you are on the train as Robert Cath, you may/may not hear certain conversations and interactions between characters. The characters will interact with each other and go about their business regardless of whether you are in "ear-shot" or not, yet if you approach characters to interact, you may get different responses, depending on what you have done or haven't done in the game, etc. A beautifully conceived game by Jordan Mechner, creater of the Prince of Persia games. Although this game won accolades upon release, it wasn't incredibly well-received, and the Smoking Car Productions (Mechner) that produced the game folded quietly after the game's release. I would highly recommend this game for those history buffs who like trains and like to solve murder mystries on them. The soundtrack for this game is nothing short of classic Hollywood. The game takes to you inside The Orient Express. Europe is literally on the brink of World War I. You are a young American doctor who is invited by a close friend to join him on a trip to Constantinople. Before you even board the train certain events have transpired, which affect the rest of your journey. The story revolves around the charcters on the train. And you meet several interesting ones - a German industrialist, a Russian anarchist, a young and innocent Russian girl and her grandfather, a remnant of the Czar, a Serbian rebel couple, a North-African tribal chief, just to name a few. In all, about 30 charecters. You really have to understand each character, their mannerisms, and their movements and behavior in general. They all play an intricate role in making the story. the best adventure game I've ever played! When I started playing LAST EXPRESS I felt a bit annoyed because of the screen presentation (the game used only about the middle third amount of the computer screen when walking through hallways on the Orient Express). But all negative thoughts thoroughly evaporated when I got into the flow. There are dozens of characters to get involved with, and I never felt a lack of plot or characterization. Even the minor characters such as the cheif berating his apprentice behind the dining cart curtain gave me something to laugh about. And unlike many of the adventure games out today, there is more than one way to play it. As another reviewer mentioned, you could simply walk around and listen to conversations, you could choose to ignore the characters that you find to be "creepy," or you could just follow up on the events leading to the world war by reading the newspaper that is changed once in the game. I think that the cartoonish style is an interesting touch because I understand what the creators meant by using it. Too often when there is digital video graphics in a game people tend to concentrate on the graphics instead of the plot, which is the heart of adventure gaming. In short, I couldn't stop playing. If you are the type of gamer which need to blow something up every five minutes, this game isn't for you. If you are interested in a game with thought-provoking conversations, and exciting events occuring one after the other (including scenes where your character REALLY DOES fight!) you should seriously consider buying THE LAST EXPRESS. If you are an adventure gamer (or a beginner in this genre) that is interested in history, or the out-break of the first world war, this is a GREAT game for you. This game had a hard time being widely accepted, as it came out at a time when the gaming industry was hyping cutting edge graphics, and more thoughtful (but less graphically exciting) games like this were basically ignored. This is a beautifully crafted game that takes the player back in time to an earlier era. The story takes place in the last days before the Great War changed the face of Europe forever. You are a rogue American adventurer named Robert Cath, and all the action takes place aboard the Orient Express on its final trip from Paris to Constantinople (modern day Istanbul). Players will first notice that the game uses a sort of stop-motion comic-book style of animation. This is the game's only serious hurdle. Some folks dislike it, others don't mind it at all. I thought it added to the game, as the Art Nouveau style of the graphics lent the requisite old-fashioned air to a game set in Europe in the early years of the 20th Century. Had it been made using a more modern style, I feel it would have lost something. As it is, the visual choice that the developers made seems perfect for the period and serve to draw you deeper into the story. Another choice the developers made was to make all the game action take place in real time. Again, this choice may be disliked by players who want fast-paced excitement all the time. At certain periods you have time to just drink in the atmosphere of Europe on the brink of war. This is part of the game's allure. It's a game for people who like to change into a robe on a winter's evening, set a roaring fire in the fireplace and curl up in an overstuffed armchair with a well-written historical novel. The game presents players with a traditional adventure story, and a rich and deeply involving one at that. The action starts in a Paris train station, and you are soon aboard the Orient Express. As you board the train you have no idea what the next 48 hours will bring, but you will be called on to perform deeds that will determine the very future of Europe. As the story unfolds, you are torn between your allegiance to yourself and your responsibility to save Europe as it plunges into chaos. You will experience adventure, the temptation of riches, love, and tragedy as the Orient Express takes you inexorably towards your destiny. This game is probably the best game I have ever played. I have owned it for 8 years and I think I've had it on my hard drive all of that time. In terms of atmosphere and story it is unmatched. I am not ashamed to say that it is the only game I've ever played that has made me weep for the characters. Emotionally engaging, deep and ultimately unforgettable, for me this is the perfect game. This game is no longer available in stores, but if you can find a used copy, buy it. If what I've written above appeals to you, you will love this game. Although it was written for Windows 95 it plays perfectly on modern Windows XP systems. 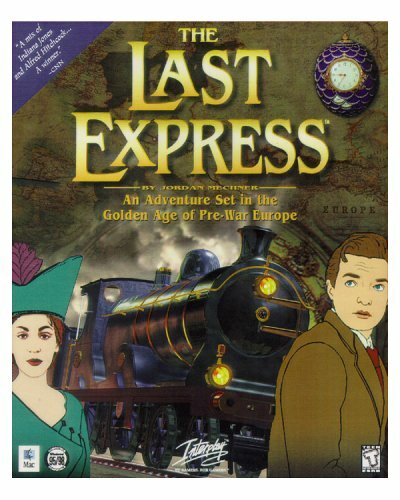 The Last Express is all that an adventure game should aspire to be - artistic, enthralling, humorous, and captivating. Up until recently, this classic was out of print. Originally published by Broderbund, TLE was a sleeper hit garnering rave reviews, but backed up by modest sales. I had to track the game down on Ebay before finding out a week later that it was being re-released under Interplay. Damn! At any rate, the graphics are more "art" than flair. The animation is slightly jerky, but like most people who play it, you'll get used to it and appreciate the finer elements before you. Without a doubt, this is some of the best voice acting you will find in any game. All the different languages you'll hear immerse you in the story - close your eyes, and you'll think you're on board the Orient for the murder mystery of a lifetime. The only potential drawbacks (every game has flaws) is the awkward game-save system, and the sometimes confusing feeling that you're not where you're supposed to be. The game plays out in realtime, and all the characters on the train have a routine. If you're not in the right car at the right time, you may miss something. Then again, that's also half the fun - running around trying to figure out what to do, where to go, and who to trust.